"Agriculture Moves Onward." The final mural of the Historical Panorama of Alabama Agriculture and a testament to the boundless faith Americans once invested in the march of scientific/technological progress. Some 100 years ago, Extension educators were crusaders in the truest contemporary meaning of that word. We were crusaders for a cause, the cause of scientific/technological progress in farming and homemaking. Extension educators were dispatched to every rural hamlet in America to impart the message of scientific and technological progress. In manner of speaking, we were techno-crusaders. Perhaps no other artistic rendering better expresses our techno-crusader role than the final mural of the Historical Panorama of Alabama Agriculture. 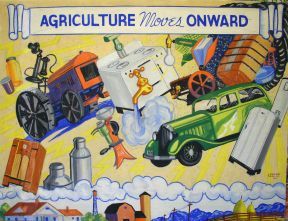 Commissioned along with the other murals for display at the 1939 Alabama State Fair, it underscored how adopting scientific and technological practices on the farm would secure a veritable cornucopia of material goods and creature comforts. This faith in scientific and technological achievement was not confined to Extension educators. Americans in general once possessed an almost boundless faith in science’s potential for securing material comforts and, with it, a generous measure of human happiness. As a one of my Extension colleagues once noted, Americans as recently as the 1950s routinely passed highway billboards unabashedly proclaiming “Better Things for Better Living…Through Chemistry” without so much as blinking an eye. Such a message today would invariably be interpreted as a twisted joke. How times have changed: Extension educators are now struggling to navigate their way across an increasingly steep, jagged divide between techno-skeptics, who harbor a deep mistrust of technology and its long-term implications, and techies, who, despite some misgivings, generally believe that each technological advance ultimately works to secure a better life and world for all of us. But why should we be surprised by this? Science, after all, is as much a process of refinement as it is of discovery. With this refinement has come a clearer understanding of the environmental costs associated with scientific and technological progress. Scientific farming practices have proven to be no exception. To be sure, we Extension educators should take immense pride in what we have built within the last century. As one of the world’s premier philosophers of technology, Kevin Kelly, stresses in his recent book, What Technology Wants, the highly mechanized, petrol-dependent farming model we helped construct in the last century has been indispensable in many respects. It provided the “foundation of leisure” that promoted a drastic increase in population, which, in turn, generated the intellectual insights that define much of the 21st century. Nevertheless, Kelly is one of a number of techno-pundits who foresee the inevitable rise of a new, more sustainable, possibly even more decentralized, farming model, though one that incorporates many of the scientific and technological attributes of the current model. In building a new model that incorporates elements of scientific/technological farming and sustainability, the need for Extension educators will be more critical than ever. Who but Extension is equipped for this task? Our intimate understanding of the current scientific farming model provides us with one critical insight that many green proponents are now only reluctantly beginning to accept: replacing the prevailing farming model with a wholly sustainable model is not only impractical but impossible given the present state of science. We have a indispensable role to play in the future not only in bridging a divide between hostile camps but also in helping articulate the elements of this new farming model, piece by piece. Consequently, we will be called upon to abandon our traditional role of technological crusader and to accept a new role as technological conciliator. Our new role as conciliator not only will be confined to the farm sector. There will be an increasing need for public intellectuals within Extension — people equipped to explain to the general public how this new farming model will be expressed and how it ultimately will affect them. Herein lies an enormous opportunity for Extension — an opportunity for profound organizational transformation. Future generations of Extension educators may reflect on this chapter of our history as our finest hour.